The municipality, residents, advisers and suppliers have collaborated on a flagship project to inspire the municipality's forthcoming urban renewal. 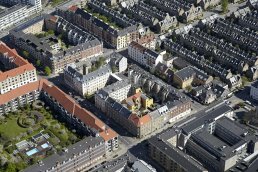 As part of the Copenhagen Municipality Climate Strategy, the project based in the Østerbro district demonstrates how an old building can be climate- proofed and simultaneously enhance the residents’ quality of life. The municipality has collaborated with local actors to develop and test climate adaptation solutions. Once the five-year project is completed in 2018, the buildings, facades, courtyards and sidewalks will be fully renovated. Rainwater is the main focus of the project, as effective management will minimize damages caused by future downpours. A stream was placed in the center of the apartment block’s courtyard, connecting the buildings to a water supply of collected rainwater. This allows the rainwater supply to be channeled into houses for laundry and toilet flush purposes. The lessons learned from the project are already being applied in the municipality’s other urban renewal projects. The innovative design feature reduces grid water consumption of the properties by 27%. In addition to handling rainwater on the property and consequently preventing flooding, the renovation will reduce heat-island effects, lower the buildings’ CO2 emissions by 16,800 tonnes and offer recreational value to residents. The courtyard facade features improved insulation and ventilation, as well as allowing in more daylight. It also facilitates outdoor socializing among residents. This project in the Østerbro district has increased the recreational value of the area and strengthened locals’ sense of community, both within and between the individual apartment buildings. The project aligns with the city's climate targets by reducing the buildings’ energy consumption by at least 25% and handling all rainwater on the property.